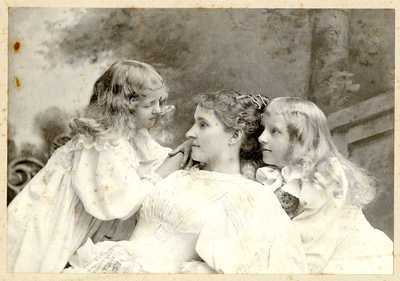 "Woman and Girls in the Dutton Family Papers "
This photograph of what appears to be a mother and two daughters was saved within the Dutton family papers, an Ellsworth family related to the Briggs and Craig families of Augusta. The mat is stamped from the studio of Chas. Stearns. No other information or date is provided.